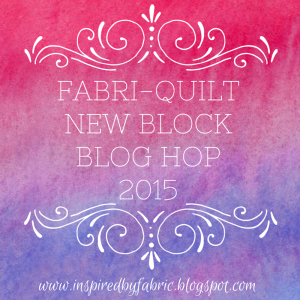 It's my turn on the Modern Plus Sign Quilts blog hop hosted by Cheryl @ Meadow Mist Designs and Paige @ Quilted Blooms. Both Cheryl and Paige have signed copies of their book available on their Etsy shops, and Amazon has the physical and digital versions of the book. I made the Celestial pattern. It's made with 24-inch blocks, for a total size of 96 x 96 inches. I decided to make a smaller version, with just four blocks, and it measures 48 x 48 inches. The fabrics are a turquoise polka dot and Kona Cactus. Both fabrics were chosen after I chose the binding fabric, an awesome plus print. 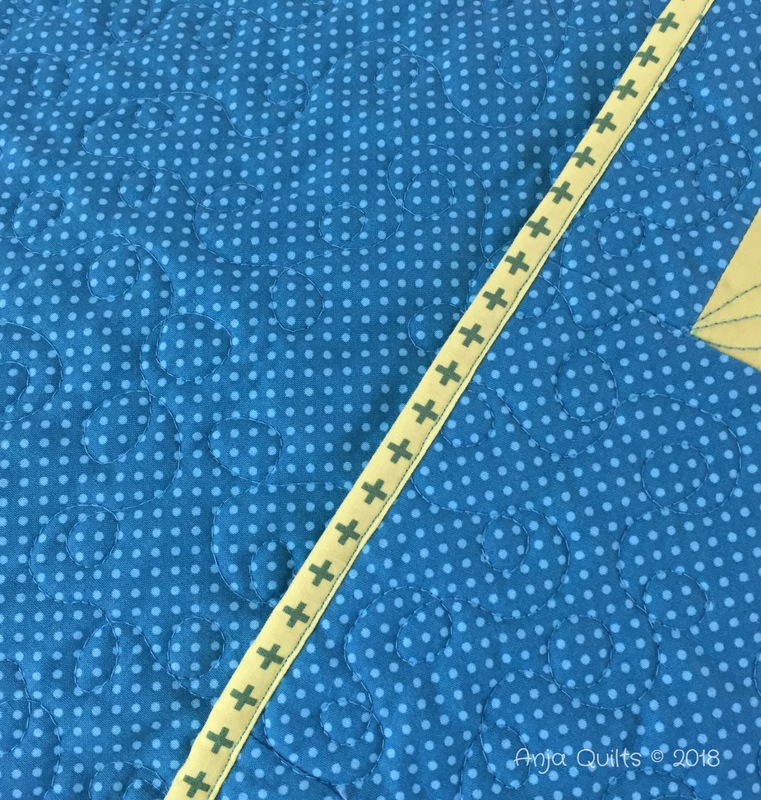 I've never planned a quilt around the binding fabric. It was quite fun. I decided to try a new quilting motif. I should have stayed with tried and true. I definitely need practice with curves. The curves got a little better once I drew lines as a guide. I wanted to make a plus on the back, but I ran out of fabric, so it ended up being a 9-patch. 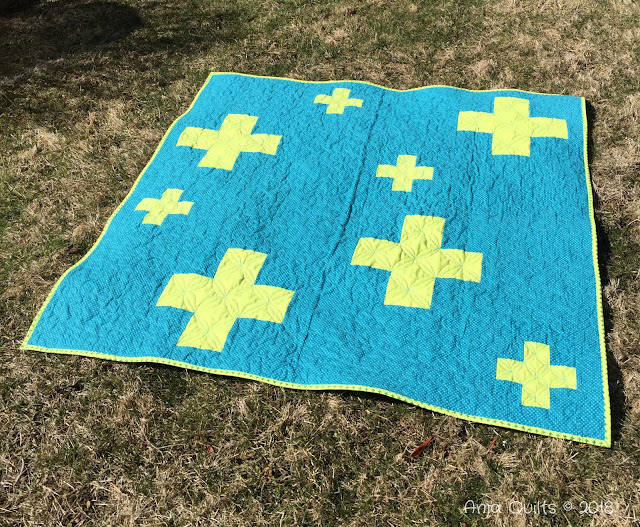 Since the background was a bit busy, I quilted it with all-over loops in a matching turquoise thread. It blends with the background, but it gives the quilt some texture. If you don't look close up, my curves don't look too bad. 😉 I used the same turquoise thread. A few more photos just for fun. 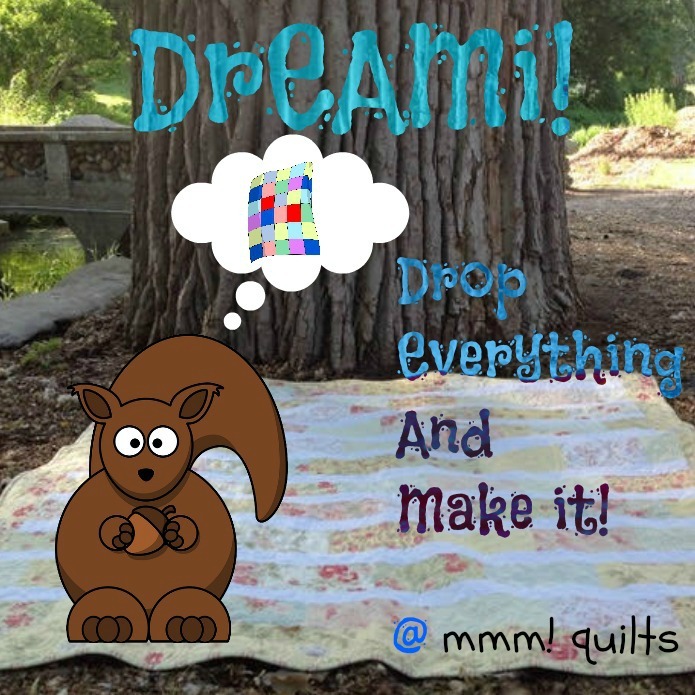 I hope you find time to stop by all the blogs participating to see all the quilts that are in the book. 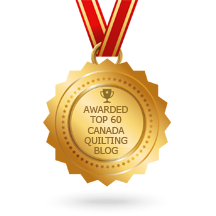 If you're visiting Anja Quilts for the first time, I hope you take some time to look around and perhaps follow me if you like what you see. I'm glad to see you can still get the effect of the random plusses with just 4 blocks Anja! The colours are great and your quilting motif was a great idea. It looks great from a distance and is undoubtedly a billion times better than my attempt would be! I was so curious to learn how picking fabrics based on the binding would go, and I love it! What an awesome way to go. I think it looks great, and the texture from your quilting is really fun. Any plans for the quilt? I love your two colour version and how clever to choose the fabrics based on the lovely binding fabric, it works perfectly. I really like how you quilted it, it compliments the quilt design and once it’s washed the very slight wonkiness I wouldn’t have noticed if you hadn’t pointed it out won’t be noticeable. Love it. Great looking quilt! The colors are so pretty together! The only way to get better at quilting is to keep practicing. We are so hard on ourselves. I think you did very well. Great concept to pick the binding fabric first and go from there. I love it. 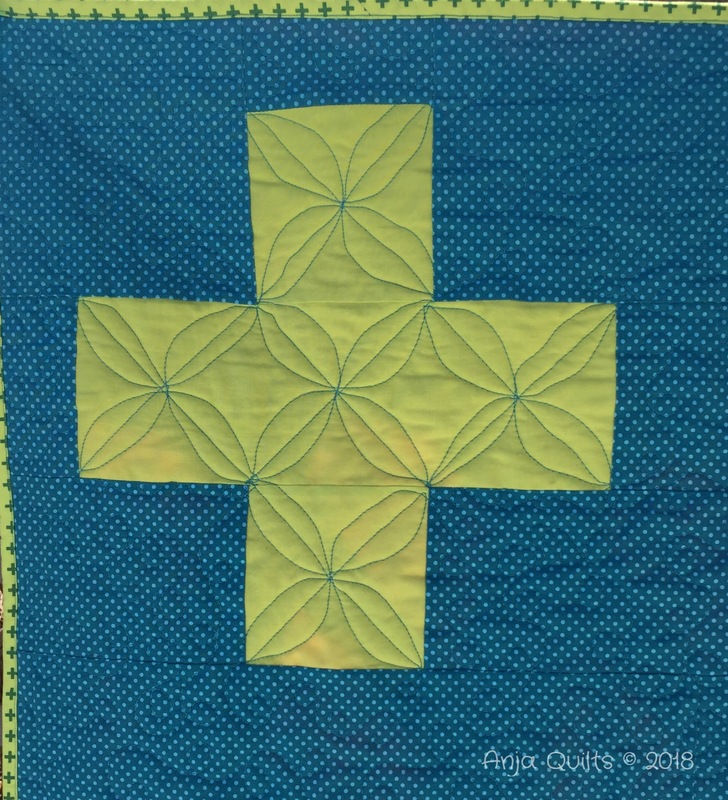 I also love the simplicity of your block quilt with the more complicated quilting. And your colours go really well together, loving the pop of orangey pink in the back. Very nice! The quilting really does give it great texture. 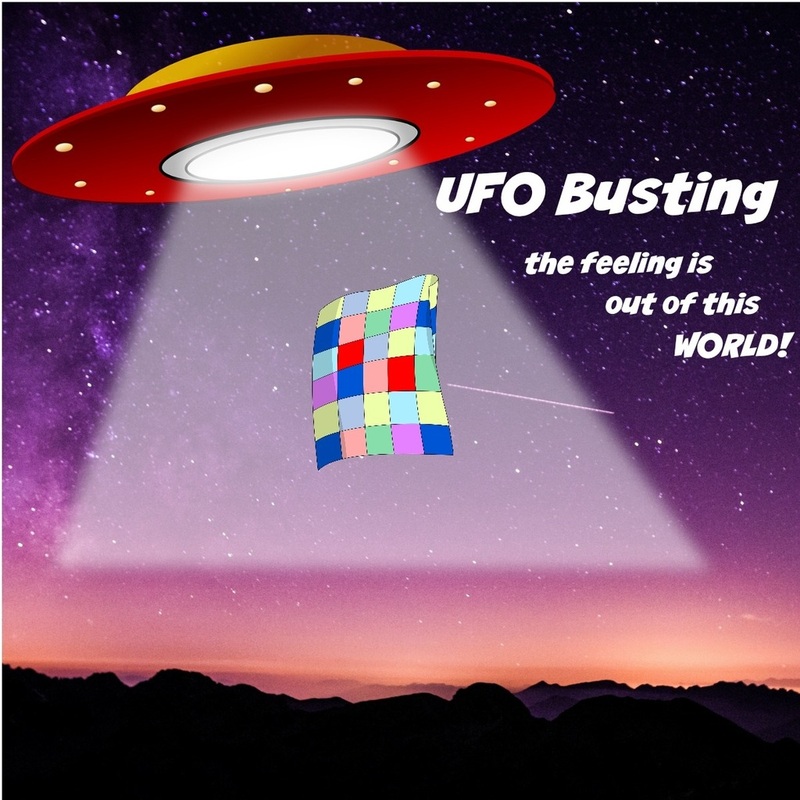 Awesome that your inspiration came from binding fabric. Great job! Love your orange peel quilting!!! What a great idea! Beautiful version of Celestial! I love the how you started with the binding and built the quilt from that. Thanks so much for being part of the hop!! Your fabric picks from the binding look great! Love the quilt! It looks great Anja! 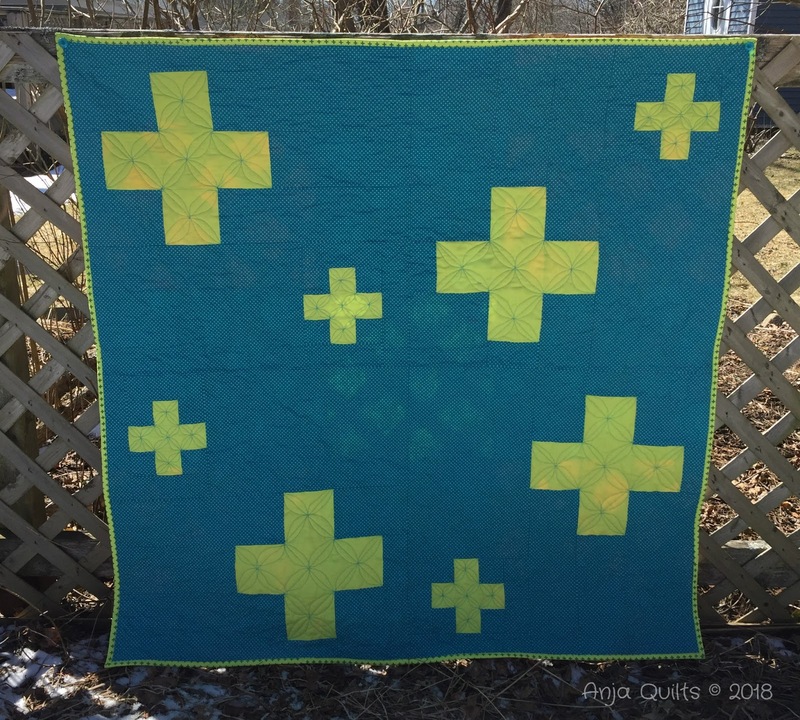 I love the orange peel quilting in the plus signs and it's nice to see a smaller version of the quilt. I like your quilt, Anja, and thank you for showing your quilting. I'm still struggling with free motion and I'm hesitant to show it in my posts. You've encouraged me today! I think your curves are coming along well! 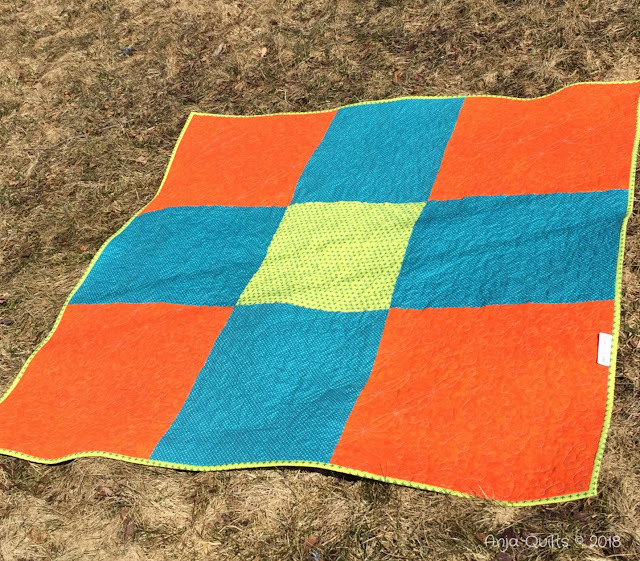 The orange peel quilting in the plus signs was a clever idea! I like that you carried the motif to the back and it still looks like a plus, really like your choice of colours too! Beautiful Anja! I'm partial to orange so i really love your 9 patch backing. Turquoise too....it makes Kona Cactus Plus's just pop up. I love that the blocks are so big!! Your quilt is wonderful! I especially love the colors you picked and the binding ties it all together! 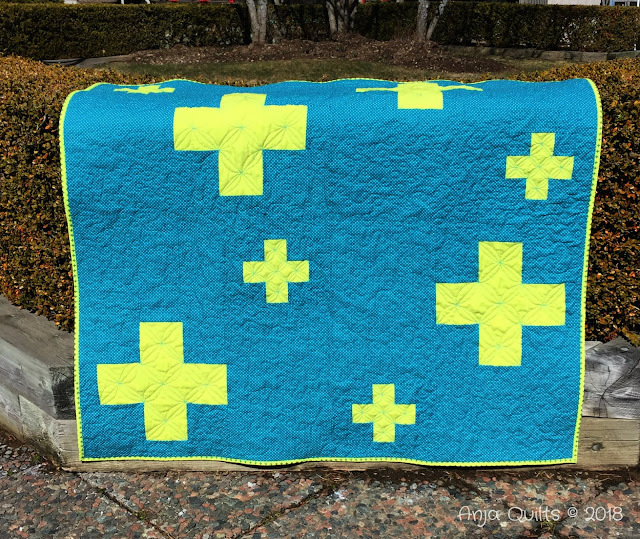 Quilting...I admire that you gave it a go and shared your results. 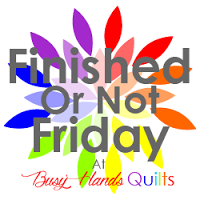 I struggle with FMQ all the time. You know...a good wash and who's the wiser?! I've seen several versions of this quilt today, and they're all so beautiful! I love this 2-color version you put together, and those colors are just luscious. I want that on my couch. It is so gorgeous! I love this version ❤️❤️❤️ The colours are bright and bold. What a colorful and cheerful quilt. very pretty fabrics and work. Hi, Danice. You are a non-reply blogger, and I am unable to respond to your comment (and previous comments on other posts). I couldn't find an e-mail for you on your blog. I love your version. You did a great job matching that perfect binding fabric. I love the colors and how the pluses pop! Your quilt is wonderful and the quilting is great. I love the green fabric for the plus signs and the binding is right on!! Your quilt is fabulous! I love the way you used turquoise thread on the Kona Cactus! 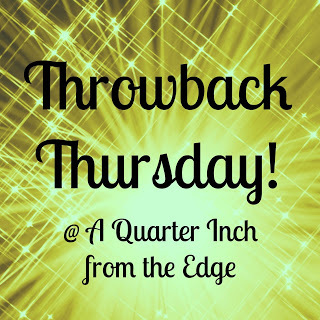 Hey, I have a longarm and have been quilting on it for 10 years...depending on the length of the curve, I will use a ruler to get it just right. 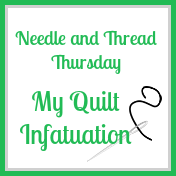 One hint I was taught was to look to where I want my needle to end up, not at the needle - it does make the point-to-point quilting so much easier! 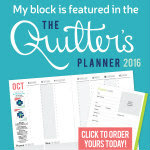 Good for you for trying out something new -- I've never built a quilt top around a binding fabric, either! 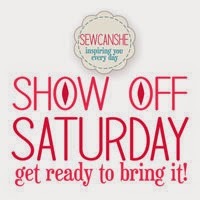 : ) And I applaud your willingness to quilt outside your comfort zone. A beautiful finish indeed! 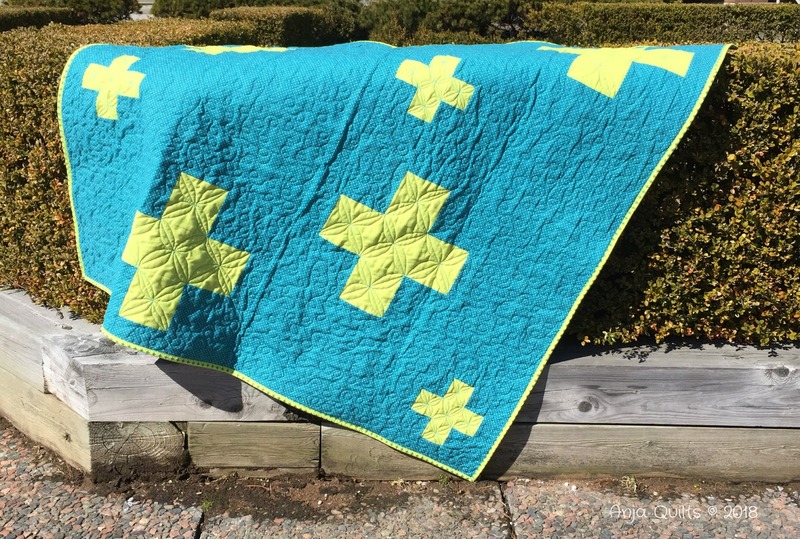 I love your quilting decisions on this and I think it looks terrific! It looks great, Anja! I love that you picked your fabrics based on the binding! :) Celestial is probably my favorite pattern from the book and I plan to do what you did, use 4 blocks total. Do you happen to know what your yardage for the background/teal fabric was? I love the quilting in the plus signs and think that it looks great, and I like the thread contrast. This is a beautiful quilt! Awesome job! 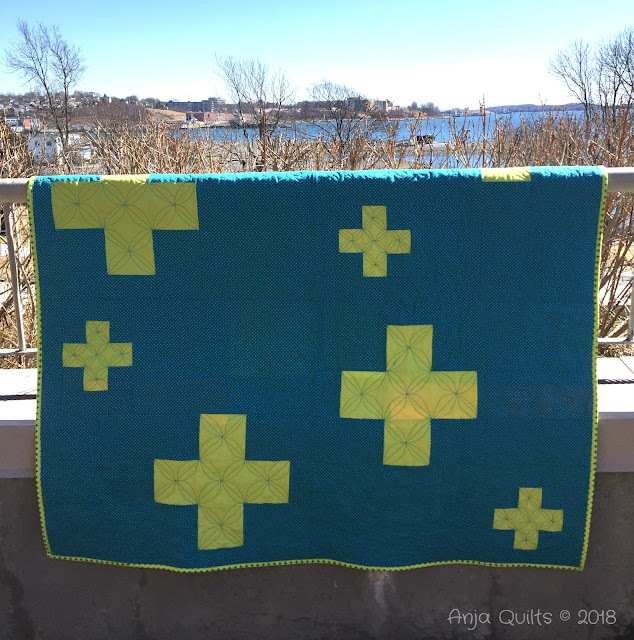 Fun colors and your quilting is perfect! Great job! Thanks for sharing! Great job! Love your color combo. Anja, you've use my favorite color combo ! And, oh, the binding! Your version of Celestial is beautiful! I really like the orange peel quilting in plus signs with contrasting thread! What a fun back, I still see a plus sign! 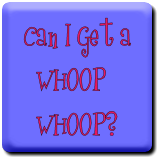 Anja, thank you for contributing to the hop! Fab-fabulous as I said yesterday on IG. Love that binding though! And nope, never have made a quilt around a binding either, but you did it with grand success! It takes courage to reveal your less than perfect quilting and I admire you for doing just that. Fabulous indeed, like Sandra said. Oh, how fabulous that you chose your quilt colours based on the fabric for the binding (which is perfect, by the way!) - a gorgeous combination! Love your quilting, I think it looks beautiful and is a lovely complement to the linear design of this quilt. Fantastic finish! 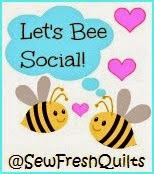 I do follow you and this quilt is just lovely! I'm sure that I definitely would have to draw the curves on. 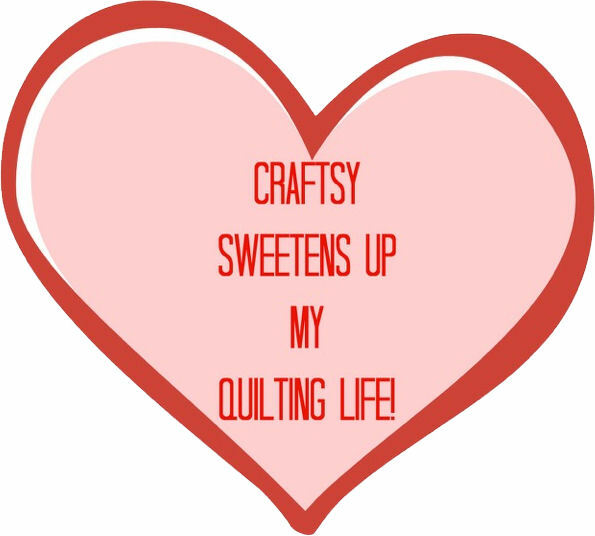 It's mostly straight-line quilting for me. Very nicely done! Great quilt - love the color choices! Love the colors on this one! The almost plus on the back was a wonderful way to finish it. I really like the quilting you did in the plus signs!